I’m not much for museums. I’m very bad at sight seeing. I usually have a good time when I go, but my attention span is limited. On the other hand, I DO like seeing new things: pictures, art, places, buildings. It’s a matter of duration, I suppose. So SL plays wonderfully for me in that respect. Many of my friends are very artistic, very into art and building and creating. They participate in art shows both as artist and public. That’s how I get MY education – they bring me along with them. It’s easy for me to get there, I don’t have to do the planning, and I can leave when my mind wanders. More often than NOT, however, I tend to stay longer that I would have guessed. As you already know from reading this blog, I will follow Callipygian Christensen just about anywhere she is DJ’ing. So when she sent out a notice that she was DJ’ing an opening at the wonderful DNA Art and Music Fusion gallery in Captive Oasis, I was there. Once there, I discovered she was spinning…. *gasp*…. *horror*… JAZZ! /me clears throat, determined not to elaborate. You might have thought that I’d immediately tp out. But this was the opening for Bonafide Aries’ exhibit. Primary to all Bonafide Aries 2D and 3D creations is a story, an inquiry, or a statement. The stories vary and may change through the devolpment of a work. Behind the story is a goal of complete creation from scuplty to skin. Currently Bona’s works are a blending of developing skills. The poses sculpts and textures are original creations. The works begin as freehand sketches, and where necessary augmented shapshots. Graphic editors: gimp, photoshop. are used to enhance the work and give it RL textures for Secondlife display. The RL Bona was taught the fundamentals of art in RL by a mother who painted, a father who was a graphic designer, and a tribe of wild bohemians who desecrated country barns and refurbed condemned houses (Bona carried the crowbars) of course bonafide’s RL grown up career has nothing to do with art. 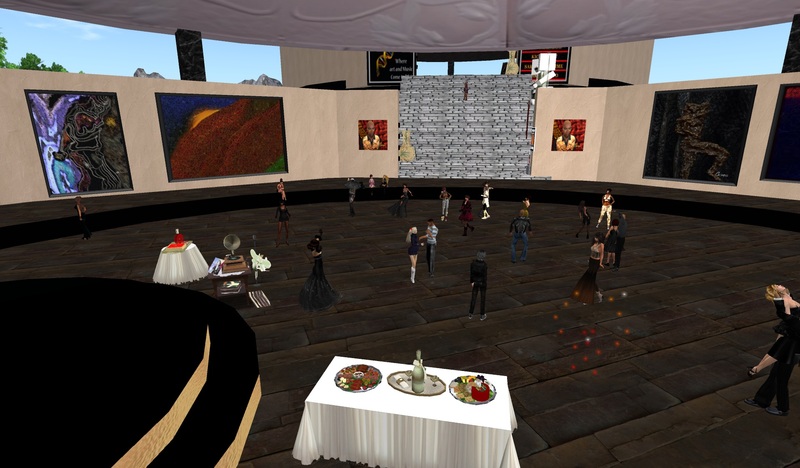 It is Secondlife, and graphic editors gimp and photoshop that have reborn his artistic interests. I believe that Bonafide’s work is showcased through the month of January, but it may be closing after the 3rd week of January. So even though I was slow to post, you should be prompt in stopping by. Again – time is running out. This exhibit is over in the next week or two. It’s well worth a visit.